The three races in Asia - Singapore, Japan and Korea - have been good for my Red Bull team. No-one's getting carried away but we are starting to find some form at the right point of the championship. We put some performance on the car in Singapore, and that has started to unravel a few little paths for us in terms of upping our confidence level with what the car needed. It has been an up-and-down year for everyone. Our race pace has generally been reasonably sound, but everyone's qualifying pace has been hit and miss, us included. McLaren got on a roll for a while and they still are very strong over one lap. But with the last few circuits, we have made a decent improvement. Sebastian Vettel and I fought for the pole in Suzuka and in Korea, and we got the front row at both races, and Seb just missed it in Singapore. That takes us out of all of the first-lap mess that you can otherwise get caught up in, and there has been plenty of that going on this year. Everyone wants to know how we've done it, but it is just details, and starting to unlock a few areas on the car. It doesn't take much. The regulation change over the winter, banning blown diffusers, was an absolutely massive hit for us, and our challenge all year has been how we get the car performing as best we can under these regulations. We, like the other teams, know where we were last year. That was a lot faster car because the regulations were looser. Now the regulations are a lot tighter you want to get back to where you were, but the goalposts are different. It's like getting to the top of a tree and certain branches have been taken out. You're trying to work out how to get to the next branch. When you do, that opens up another area, and so on. This year's RB8 might look similar to last year's RB7 but it's a very different racing car and things that work on this car would not have worked on last year's car and vice versa. It's not just addressing the absence of the blown diffuser at the back of the car. There have been areas of the floor, details of front wing, a little bit of the DRS overtaking aid. There are so many areas where you have to make small improvements, and that's what the team have done. Seb has now won three races in a row and everyone seems to think he has the championship in his pocket. But think back to Valencia, where we were very strong and it looked like we were on our way again. And then we weren't. That's why Korea last weekend was a good confirmation for us that we were going in the right direction. Japan was very good for us, and normally if you are quick on that track it is a good indicator that you will be quick elsewhere. But you can say the same about Silverstone and Barcelona, and we weren't the fastest car there. OK, I won Silverstone, but I beat Fernando Alonso because Ferrari didn't choose the right tyre strategy. So our performance in Suzuka showed we had improved the car on that type of circuits - but then we went to Korea, which is different again from Suzuka. There is a bit more horsepower and heavy braking involved, and it's not just about rhythm and carrying lots of speed through lots of corners. So it was reassuring to be quick there, too. The next race is in India and I don't believe the car will be slow there either. But the big unknown is still the tyres. They have been such a challenge for everyone this year, and even now, with only four races to go, no team is getting ahead of themselves in believing they really understand what is going on. I got a flight straight after the race in Korea to Tokyo and I was going to go into the city for a few beers, but I had a shower, went on the internet and only then realised Felix Baumgartner was doing his world-record breaking skydive. "I couldn't get away from it. I watched the whole lot," says Webber of Felix Baumgartner's 'space jump'. I couldn't get away from it. I watched the whole lot. It was brilliant. I had never imagined - and I should do given I work for Red Bull - the effort they had gone to get all the vision and everything right for everyone watching. There were some nervous moments on the ascent when he was concerned about his visor but there were plenty of contingency plans built in. It's fundamentally an egotistical thing, obviously, going out and taking on that challenge - and we all love what he did because 99.9% of us just wouldn't do it, couldn't even begin to imagine how to go about training for it. But there were also scientific benefits from the jump - some of the data he gathered will be of use to people in the future. It's just great in the era we're living in, with everyone a little more risk-averse, that you still have people out there trailblazing and doing things that are completely extreme, and finding things out about themselves at the same time. Before going to Korea from Japan, I did a promotional event with Usain Bolt which involved me driving him from Tokyo airport into the city. The event was based around Nissan's GT-R sportscar, which Usain is a big fan of. He was going: "I'm going to get one of these. What modifications should I get done to it?" So I gave him a few facts about what's important in a really, really quick road car. Webber tweeted this picture after driving Usain Bolt from Toyko airport to the city centre. I said: "Look, make it as light as possible. F1 drivers, we love cars to stop and accelerate and turn. It's not just always about horsepower." Now he wants to make his GT-R even lighter than it already is, which will improve the brakes even more. We spoke about London 2012 and Mo Farah - I was down there for some of the events and saw Usain race. It was really interesting to get his take on all that, as well as where he grew up and the influence his parents had on his life. We had a fair bit in common on that - those things played a huge role in making him what he is today, as they have for me. He's like an actor in many ways. He has two sides to him. He's a phenomenal athlete but also an entertainer. He loves giving something back, and I asked him how he was so relaxed before a big race, such at the Olympics, when most people are really anxious. He said: "I know if I've done the work, I'm gonna win." Like everyone, I look up to Usain and admire what he has done, and obviously grand prix drivers get some of that from the public ourselves. He's a global superstar, and I'm not, but I do still travel the world and compete internationally and see some amazing things. So there are some similarities. It was funny when we got to the hotel, and there were athletics people wanting to interview him, and F1 people wanting to interview me. When sports people meet, from whatever arena, we have an appreciation for what the other is doing, and when you meet someone like that the ice-breaking is done pretty quickly because you basically know that you are on a similar channel to each other. I have to admit I was a little bit star-struck initially, just because of everything he has done and how unique he is. But he was just a good lad. 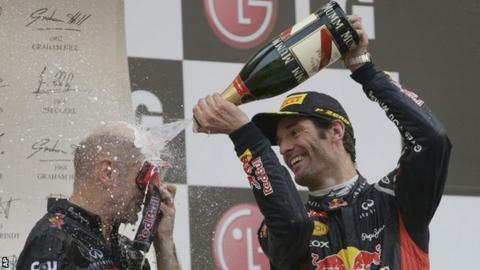 Mark Webber was talking to BBC Sport's Andrew Benson.